Black and white. Paul Armer, Gordon Bell and Bill Aspray in front of a display case at the Digital Computer Museum near Boston. Armer is holding a coffee cup and listening to Gordon Bell who has his back to the camera. Bill Aspray is to the right. 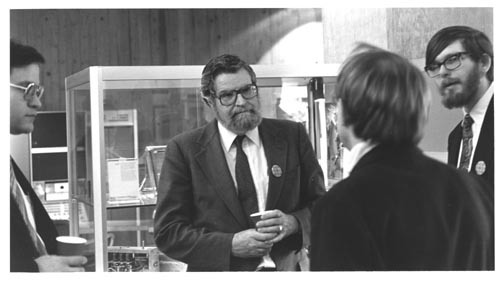 These three people were attending a lecture given by German computing pioneer Konrad Zuse at he Digital Computer Museum near Boston on March 4, 1981. Man to left of photo is unknown. Verso: White paper label "Paul Armer, center Gordon Bell back of head, Bill Aspray"